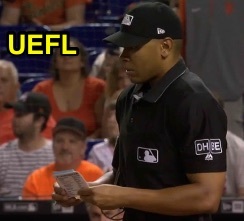 HP Umpire Jeremie Rehak ejected Giants pitcher Madison Bumgarner (balls/strikes; QOCY) in the bottom of the 6th inning of the Giants-Marlins game. With none out and none on, Marlins batter Brian Anderson doubled, JT Realmuto singled, Cameron Maybin hit a sacrifice fly, Justin Bour walked, and Lewis Brison singled, after which Giants Manager Bruce Bochy effected a pitching change, replacing Bumgarner with reliever Reyes Moronto, during which Bumgarner was ejected while leaving the field. Replays indicate of the nine callable pitches thrown in the inning prior to Bumgarner's ejection (all of them called balls, including the four-pitch walk to Bour), all nine were properly officiated (accuracy = 100%), the call was correct. * At the time of the ejection, the game was tied, 4-4. The Marlins ultimately won the contest, 7-5. This is Jeremie Rehak (35)'s third ejection of 2018. Jeremie Rehak now has 10 points in the UEFL Standings (6 Prev + 2 AAA + 2 Correct Call = 10). Crew Chief Mark Wegner now has -2 points in Crew Division (-3 Previous + 1 Correct Call = -2). *The called ball closest to the strike zone, ball one to Bour, was located at px .824, which is 1.090 horizontal inches from being deemed an incorrect call. *UEFL Rule 6-2-b-3 further states, "In the event of a called ball four, in an at bat that has lasted no more than four pitches, including the called ball four, the four called balls shall be adjudged to have been correctly ruled, provided that the Pitch f/x chart for the at bat does not include any pitch within the bounds of the strike zone. Borderline pitches in a four-pitch walk at bat shall be deemed as having been correctly called, due to the unrealistic chance of an alternative outcome." This is the 57th ejection report of the 2018 MLB regular season. This is the 27th player ejection of 2018. Prior to ejection, Bumgarner's line was 5.1 IP, 4 ER. This is San Francisco's 4th ejection of 2018, T-1st in the NL West (ARI, SD, SF 4; COL 3; LAD 1). This is Madison Bumgarner's first career MLB ejection. This is Jeremie Rehak's 3rd ejection of 2018, 1st since May 21 (Mark Trumbo; QOC = Y [Balls/Strikes]).